Discussion in 'Article Discussion' started by Gareth Halfacree, 27 Sep 2012. Could finally have a way of competing with Intel on price and performance. Hmm, seems Bit Tech haven't agreed to AMD's demands on this release, lots of sites running AMD stage managed 'Previews' of the chips. None of which show the CPU's weakness....slow (relative to Intel) x86 performance. Anyway, I'm sure if you want a cheap HTPC or 2nd PC for the kids, it'll be just the job, for everyone else...move along, nothing of interest here. I doubt it! 100W TDP on the top end part, whereas an IvyBridge i5 peaks out at 77W - so AMD have created a hot monster of a chip that relies on brute force (ie: high clock frequencies) to get on par with Intel. Yes, the graphics core will be better, but in the enthusiast market every man and his dog has a discrete GPU in their gaming desktop. 100W TDP on the top end part, whereas an IvyBridge i5 peaks out at 77W - so AMD have created a hot monster of a chip that relies on brute force (ie: high clock frequencies) to get on par with Intel. Yes, the graphics core will be better, but in the enthusiast market every man and his dog has a discrete GPU in their gaming desktop. The IGP is also by far better than anything Intel put inside IB. 100W TDP is not chockingly high. and for a small HTPC with a pico psu it is perfect. You have a more than capable CPU with a decent GPU, maybe not suited for high gaming, but enough for casual gaming or some GUI acceleration (XBMC, etc). 100W is still less than i3 + low end discrete GPU. I said desktop gaming rig, not a HTPC, for exactly that reason, but hey, if you don't want to read posts properly then that is your call.I even said that the AMD would have a better onboard GPU. The Intel is lower. Lower TDP also means less heat being dumped in to the cooling system. AMD can't survive as a going concern if all they sell is HTPC processors. They need to compete in the desktop space as well, which means they need to overhaul their architecture (again) and not try building off the failure that was Bulldozer. Thirdly : Not every one here are gamers, not every one on hearth are gamers. If AMD cannot compete with Intel on "gamer" CPU, then they can compete on good casual CPU. For a home / familly / univ purpose, those CPU are nice. PS : And for A gaming rig I'd like CPU with no IGP (like the Intel core "P" series), mobo with no onboard sound and no display conenctor (saving space on the io shield for, lets say, more USB). PS² : Sorry if I seam irritated or aggressive, but I feel like eveyone are taking there personnal use as the general case. Those are enough figures to prove it is a viable solution for do it all + casual gaming. Lets see how the GPU portions compare first before we start casting judgment. Yes wed all put money on the AMD chip being less efficient, but how much will that 22w matter when we see the benchmarks? Does the AMD offering give you vastly more graphical grunt in its 100W package than the more efficient 77W i5? After all, it is a jack of all trades approach, and it does fill a gap in the market, question is can it tease casual gamers away from dedicated GPU's? Hmm, seems Bit Tech haven't agreed to AMD's demands on this release, lots of sites running AMD stage managed 'Previews' of the chips. None of which show the CPU's weakness....slow (relative to Intel) x86 performance. Don't panic, this is just a quick news story - I'm sure a proper review will be along once Baz or one of the other labrats has given the chips a thorough (and, more importantly, not-limited-by-AMD's-rules) going over. Where is Trinity (or Llano) marketed as a desktop "gaming" or even enthusiast cpu? And by the way ... 100W TDP is for the unlocked CPUs. Locked ones have 65W TDP, which is 10W more than i3 IB and 12W less than i5 and i7. I'm looking at one of these for a HTPC/light gaming rig for the living room, maybe in a lian li Q02 or similar. To me reasonable compute performance (certainly enough for HD video and XBMC) and enough grunt on the GPU to run a few games at 720p is great. Yes i could buy a PS3 but that wouldnt have my entire steam library at its disposal. its only 23w difference who cares, thats not even wasted electricity since i live in the uk and it means my heating turns off 3 seconds earlier and i get my 0.5p of extra money back. Looks good to me, HTPC upgrade could follow. I would ditch my 65W C2D and 65W HD 5670 for one 100W trinity, winning. I also get the benefits of moving to a modern chipset for improved DDR3 and SATA performance, in this case whats not to like? 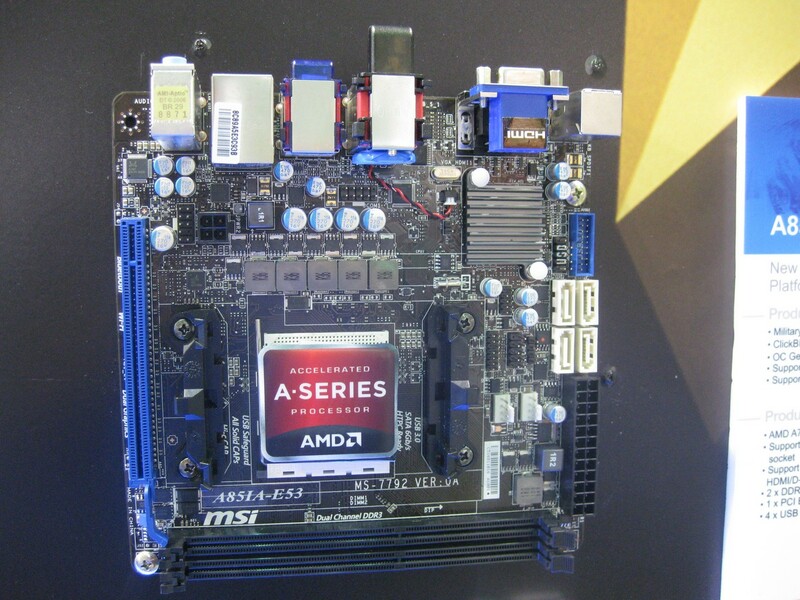 Is this still the FM1 socket or are there new motherboards too? Is this still the FM1 socket or are there new motherboards too? Keep in mind, it is not simply 23w. Most likely in real world performance you are looking at more like a 40-50w spread in power consumption. 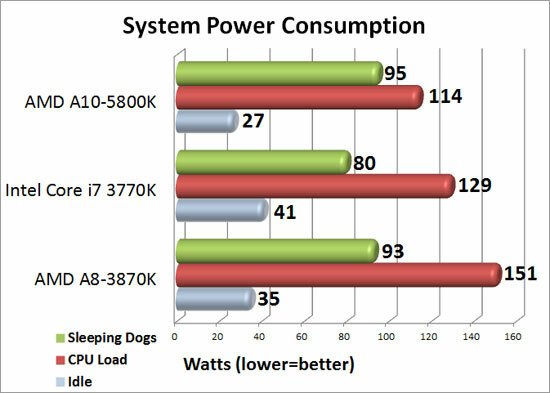 The i7-3770k while running its GPU and CPU fully loaded seems to really only tuck in around 65W of power consumption. So it doesn't actually hit its TDP rating. The 3570k without hyperthreading and the hair lower clock only seems to draw about 55w all up with CPU and GPU loaded. At least in the past, AMD chips have drawn very, very close to their rated TDP. So odds are good, their 100w chip is going to draw just about 100w with CPU and GPU loaded. So it is likely closer to double the power draw of a 3570k fully loaded. Fully loaded CPU performance without the GPU loaded is probably going to be even more in Intel's favor for power draw. Also it is rather specious to say that "oh if you aren't a gamer, than CPU performance doesn't matter as much". Okay, how about those who rely on it, for things like video/image editing? Okay, lets take those people out to. Now lets look at the casual user. 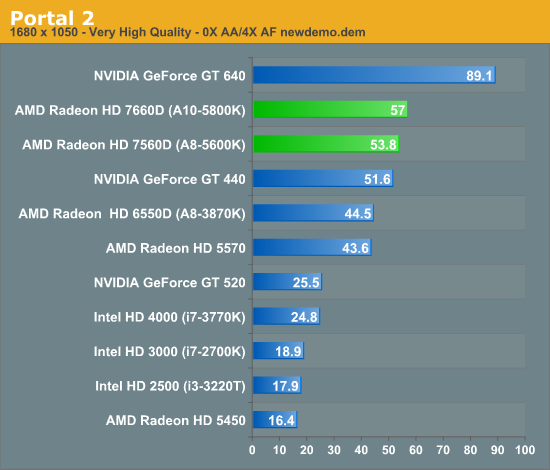 Ivy Bridge graphics are likely going to be more than sufficient (especially in a desktop, crap the HD4000 graphics in my i5-3517u are just fine and am a gamer. I'd like it faster, but they are sufficient). However, unless Trinity really is a massive boost in performance in the desktop over bulldozer, at least if you bothered to try two systems back to back, even the casual user is going to not overall increased system responsiveness and things getting done faster/smoother with the higher end Intel system compared to the higher end AMD system. CPU performance, especially single threaded, can make a big difference that even a casual user can notice. Oh, sure the systems ARE just fine for the casual user, but even if they are cheaper, that doesn't necessarily mean even a number of casual users would jump on them. For HTPC use they are great. Outside of that, at best it is a question of budget and how strict it is for a lot of people. I know me, personally, the cost differential of $50 (if even that much) is going to make very little difference in an overall system price of $700-1,000 when the CPU performance is kroggingly better (my 3570, not k, just 3570, was on sale from Newegg a couple of months ago for $199...and I am going to go out on a limb and say it is massively lower powered and massively faster in CPU performance than the top of the line trinity APU). not everyone can spend $700 - $1000 in a computer. The deerest Trinity price is $130 (for the A10-5800K), i-e the price of the lowest i3. It is faster than an i3 when compiling line of code, faster at openCL (usefull for winzip, etc. ), faster at openGL. It really is an interesting chip for budget. To be honest, who really uses an i7 or even an i5 to its limits ? 1% of the computer users, probably less. Most "gamers" could still game on an i3 without any issue. Like many people I have a job and a family, not much time to spend with gaming nor place to fit a tower. I'm not willing to spend thousands to play 1h a week. With this you can build a decent pc, smaller than a shoe box with a sub 100W comsumption (the 100W TDP is obviously given with the OC headroom in mind, just look at the locked 5700 with 65W TDP). All the comparing specified TDP-values between AMD and Intel chips makes baby pandas kill themselves and probably leads to everything else that is cute or holy to also cry blood. Those values aren't the absolute fact, they vary depending on the use and in real life (if you REALLY care) you should also take atleast the motherboard into account as well. There are far more important things than TDP when choosing a new platform... For most people the sheer x86-performance shouldn't really be the main thing, either. In most uses and for most users the differences just aren't going to make any difference. CPU-performance graphs make people obsessed with long bars and 10% performance improvements, but in real life those just don't show nearly as radically - if at all. TL;DR? Why are you reading forums if you didn't read that one? Stop comparing apples to oranges, noobs. @Bit tech staff: If you are making a review, please add bench versus intel IGP on games like minecraft, alien swarm, TF2, SF4. We all know it won't be enough for metro, BF3, etc.